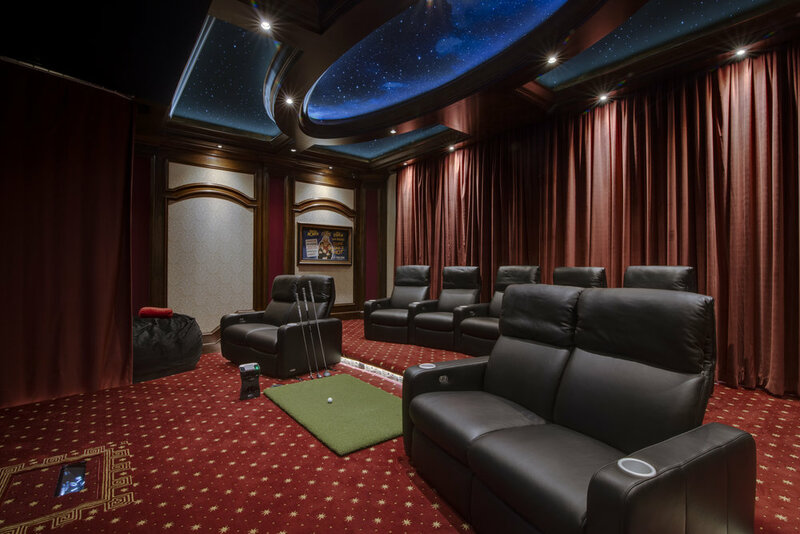 Our client, an avid golfer, wanted to convert a standard exercise room into a quality multipurpose cinema room that doubled as a professional golfing simulation system. However, neither him, nor his wife, liked the look of the typical golf simulator. His vision was a room that could be used for both purposes but did not look industrial. He asked that his picture and sound be exceptional, yet unseen when not in use and he expected the acoustics in his room to be superior to any other theater he had been in. One design challenge of this room, keeping in mind that sound quality was very important, was the wall to wall window along the back of the room. Our client wanted to keep the window and incorporate it into the overall design. There were also two doorways in the room that the client did not want to see but he did want them to remain functional. When we started discussing the requirements for when the room was being used as a golf simulator he informed us that he did not want any shadows on the screen and he wanted to make sure there was adequate protection for everything in the room from the golf balls that would be bouncing around. The client wanted the room to look like a pure theater when the golf simulator was not in use. Due to the small size of this room we definitely had to get creative when designing solutions for this client. Designing this theater took a lot of calculations, trials and creativity. The small size of the room became an issue when trying to find space for the golf simulation equipment. In order to make this room functional as both a theater and a professional quality golf simulator we came up with a few different solutions that worked together to give us a phenomenal end result. We were able to accomplish this by installing a permanent golf screen 1 foot away from the wall so when our client hit the ball there was enough movement to allow the ball to drop to the floor. We used the SIM2 short throw projector and mounted it 1 ½’ away from the screen into the stage we built. This eliminated the shadows that would occur with a normal projector mounted behind the golfer. We covered the projector with a film of Gorilla Glass to protect it. We then built a platform with a sliding rail on it which allowed us to move the front theater seats sideways providing enough room for our customer to swing his golf clubs. We also created a motorized curtain that comes out from both sides of the screen which protects viewers and property from the extremely rare errant sliced balls. To achieve the “club house” feel the client was seeking we added two café style tables and two TV’s on the side walls that are covered by the Vutec ArtScreens when not in use. We used old movie posters for the artwork which adds to the overall cinematic experience. We included a single 12’ drapery rod that opens while golfing to reveal the large window in the back of the room which opens to a real putting green in his back yard. To give our client a quality movie experience We than mounted a motorized Vutec screen with 2:35 masking which opens to cover the golf screen. We mounted the new Sony 4K Laser projector on motorized lift in the back of the room. We installed a complete Dolby Atmos system using the AudioControl Meastro M9, Parasound amplifiers and KEF in-wall speakers and subwoofers. To ensure the room was able to give him the best sound reproduction possible we hired CinemaTech to create and install a complete room acoustic package. Since the client wanted that true cinema experience with an elegant look, we used some creative design and CinemaTech panels to hide a door leading outside and a door leading to another part of the house. These panels were designed to be hidden, or secret, doors that could open with a press of a panel yet remain unnoticeable when not in use. As a finishing touch to give our client the old time classic theater experience we used special designed wood work throughout the room and star field acoustic panels in the ceiling. There were many challenges with this room and even after 10 months of working with the client to design this room we knew that a lot of what we were doing was not part of any standard system and we had to re-engineer parts on the spot to create the finished product. It takes a special kind of home owner to accept all of the challenges that go into creating such a special room and we consider him a part of the team.